So often I find myself marveling at how amazingly clever God is. Mandrake took this awesome photo of a spiders web outside our house the other day (you need to give the house a wash darling - said with the tone of Edna off The Incredibles)... and I was struck by it's beauty and also the miracle of the spider web itself. I saw a documentary last week about the study and efforts scientists are putting into trying to produce synthetic spider web. 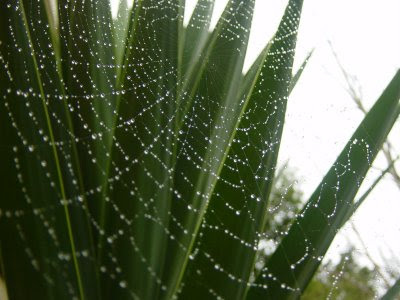 Spider web has been estimated to be about 5 times stronger than steel, twice as elastic as nylon, waterproof and stretchable. The fact that a tiny animal can make a substance that we humans with all our technology are unable to reproduce, a substance that is tough, stronger and more flexible than anything else we can make, is surely a humble reminder of the fact that God is very clever... a lot more clever than us... and yet people still think that all this happened by chance... how can we be so blind? Don't forget to stop and marvel at creation around you. Encourage your children to appreciate creation and marvel with them at how clever God is. Answers in Genesis have a really good website for kids to explore (click here) with interactive information and games. Wow that is an amazing picture. I love webs but spiders....shudder... nearly screamed when I saw that photo of Maya with the spider crawling up her arm...eeeeek! i love spiders - never could understand why all my female friends at school were so scared of them. it's not like auzzy where they are HUGE! great post kristy :) you rock! Excellent post. For the science geeks among you who may not know, spider webs are strong because the molecules in their strands are aligned with each other. Scientists have indeed finally managed to create an artificial equivalent. The strands are woven into sheets of cloth, and layers of this cloth are used in bullet-proof vests. For the conspiracy geeks among you, it is rumored that the process was created after studying material recovered from the Roswell UFO crash in July of 1947. Great post kristy, there's so many of these little glimpses all throughout creation that are immediately humbling yet pleasantly refreshing. Werner Git's book "If Animals Could Talk" has heaps of cool facts like this in it too. Good read. Wow I've been marveling at creation too lately! Love the photo..and will have to let the kids know about that site-thanks! 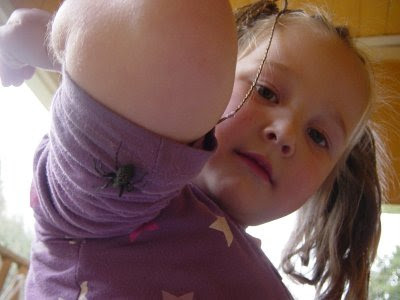 I have really tried to not show my fear of them around the kids and I think it worked... they love spiders! Hey there - nice to "meet you" I was actually checking out your blog last week from a link from someone else's blog but I was too shy to comment..
We were youth pastoring for quite a few years up until the middle of last year (now my husband runs youthalive in our state - it's for having youth events and helping youth pastors) so I absolutely understand that facet of your life! I like your blog, I'll be back! Cool photos. Isn't God amazing!